Must be the influence of Facebook but have you noticed how big it is for interactive receptions? Well, if you haven’t, it is. Take it from us – we know. There is a major shift away from the formality of weddings (and even if you’re keeping it formal there is a tongue-in-cheek aspect to the proceedings) to one of informality and fun. Most importantly, your guests want to have a great time, and not necessarily because of the food and booze. These are very trendy. Gather together an array of different props appropriate to your theme, get guests to bring their own, and you’ve got a heap of photos of your guests that no photographer could have managed. 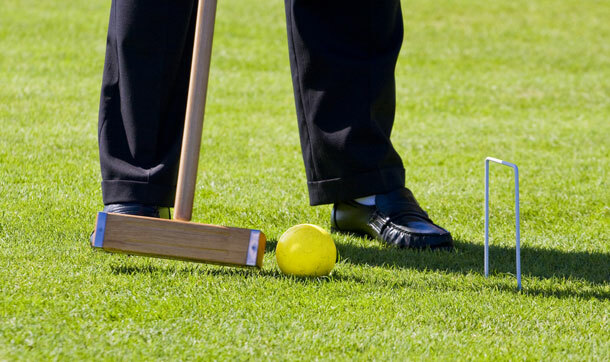 Croquet anyone? Or chess? These go down a treat at a morning or afternoon wedding reception if you have access to a beautiful outdoor space and a giant lawn. Great photo moments. For those minutes that the guests end up sitting at tables waiting for the bride and groom, provide some fun ideas: provide a feedback form headed ‘marriage advice for the happy couple’ where they can fill in their names and details and then a space for any future advice. Wedding guest books are all the rage – your guests sign them and leave you a special message. But an alternative is providing each of them with a postcard on which they can write you the message, to be collected by your bridesmaids and posted to you over the coming year.